Did you know that the total value of the jewelry industry for retail is over $71.3 billion in the United States? The above data is a huge one to give you enough reasons for investing in the jewelry industry if you haven’t already planned to do so. And Blue Mail Media can help you do it better. Our Jewelry Stores Mailing List is a data repository holding contact details of the jewelry manufacturers, jewelry wholesalers, department stores with jewelry buying offices, and catalog buyers. This is a pre-packaged database that you can get customized based on the selects – SIC/NAICS codes, company name, company revenue, location, and more. The global jewelry industry is growing like never before. And if you want to pitch your services or solutions to the professionals, companies or the individuals related to this industry, all that you need is a contact database that is accurate and updated. Blue Mail Media’s Jewelers & Jewelry Shops Mailing List is built and segmented by using the world’s most reliable resources such as trade shows, business directories, company newsletters, public filings, and government records. 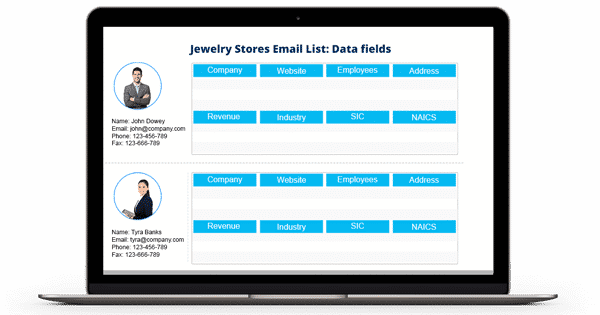 The Jewelry Store Email Database will take you to the decision makers, C-level executives, and other professionals working in the jewelry stores, jewelry manufacturing companies, and buying offices. With this database, you can also reach the catalog buyers, jewelry wholesalers, jewelry chain store owners, and more. Now, reach your most potential prospects in the jewelry industry successfully with Blue Mail Media’s Jewelry Shops Email List!